A food blogger and photographer I am not, but as I do fancy myself an inspired Home Chef I thought I would post this recipe because it actually serves dual purposes. It provides a quick and delectable update on my vow to join a CSA this spring (Which I Did), and it gives you something to try and leave comments about – which I hope you will (wink wink nudge nudge). I searched Local Harvest and found a CSA in my area that came highly recommended based on earlier user reviews. I contacted the farm owner and asked if I could pay for a one-week trial. To my surprise he offered to GIVE me a share at no cost for the following week. At first I hesitated because I wasn’t looking to get a handout, just a sample of what they had to offer. To this, he shared his personal testimony about how he changed his diet via the fresh organic produce grown at their farm, and how this shift along with accepting help from members of his community during a trying time in his life taught him that sometimes you don’t have to say anything but “Thank You.” For me, this was not only a lesson in the benefits of community supported agriculture, but in the humble art of gratitude as well. So here we are six weeks later and so far so good. I admit I was a little apprehensive having never done this before, and there were one or two items that did not arrive in mint condition; but overall the CSA has helped to regulate how much we spend on groceries each week, and I always have something fresh to cook with. 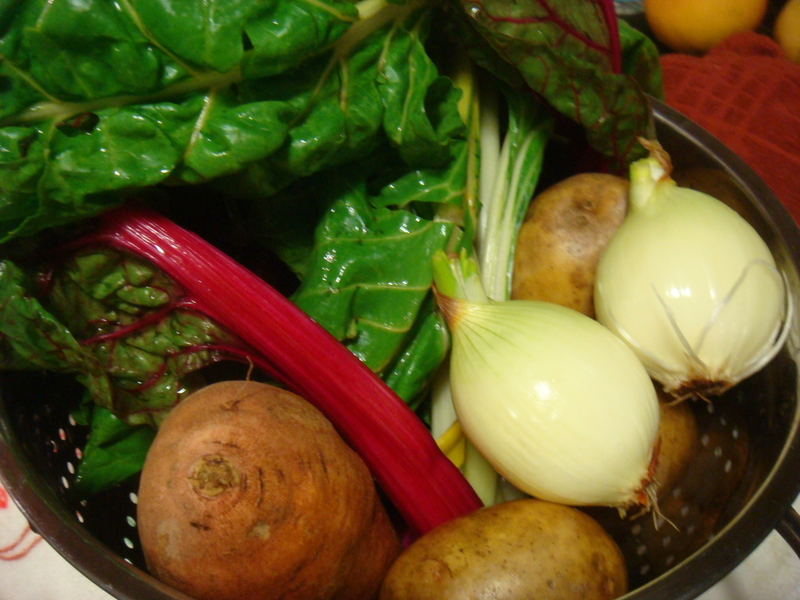 This past week we received a box filled with Rainbow Chard, Sweet Potatoes, Yukon Gold Potatoes, Onions Cherry Tomatoes and Grapefruit to name a few. 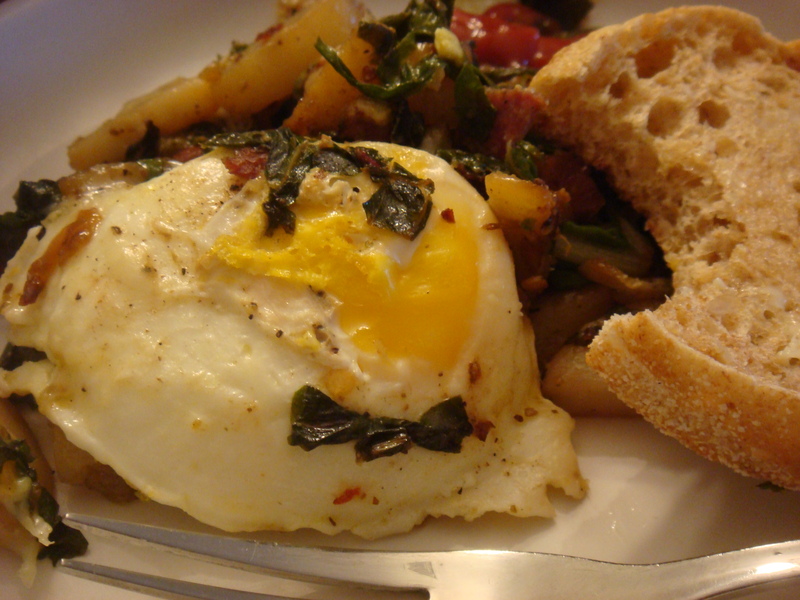 Without thinking about it too hard I did a quick search using the words “Vegetarian Hash” and found a recipe that complimented this weeks share perfectly. The best thing about this recipe is that you can make it in any way that suits you by adding or omitting ingredients, and trying different types of greens. I added Turkey Bacon and eggs (some CSA’s also offer meat and egg shares in addition to produce) so mine is not Vegetarian, but it is fresh from the Farm. 1. Heat a large skillet over medium heat. Add oil to pan. Add onion; cook 8 minutes, stirring frequently. 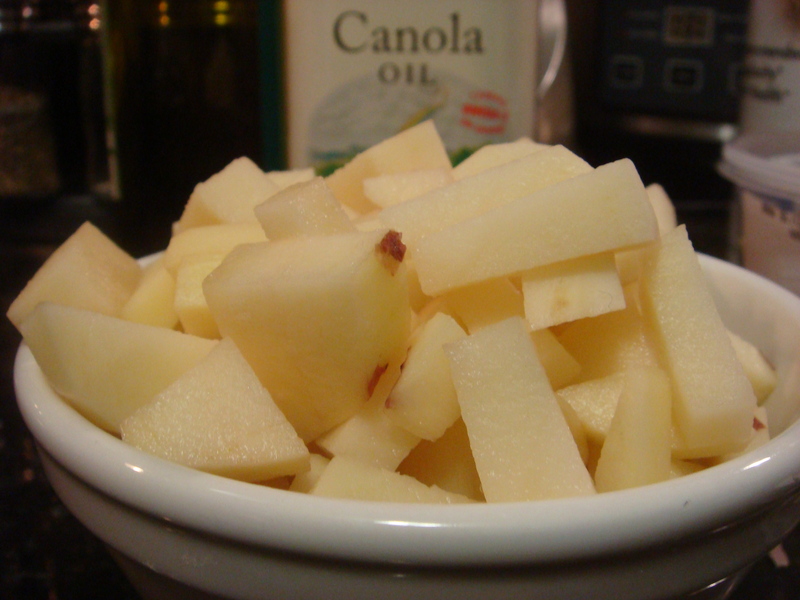 Add potatoes and garlic; cook 15 minutes or until potatoes are tender, stirring occasionally. Stir in 1 teaspoon paprika, 1/4 teaspoon salt, and 1/4 teaspoon pepper. 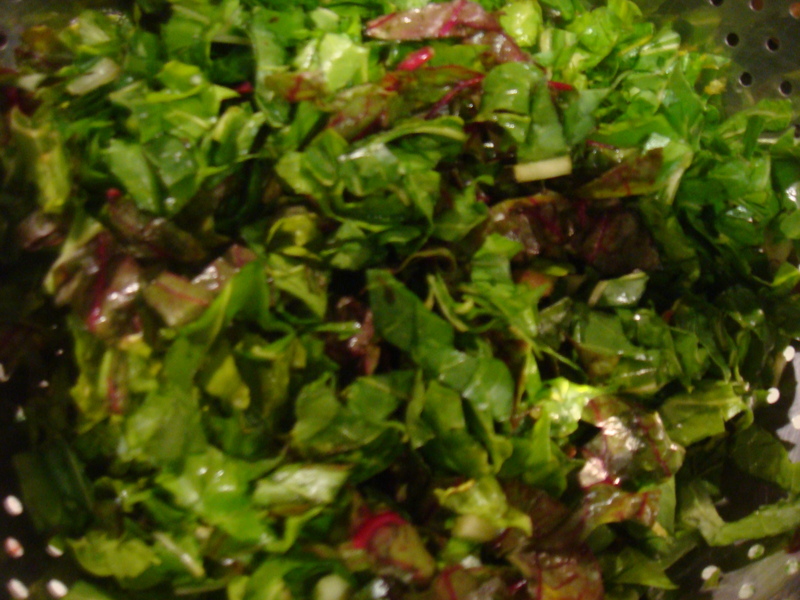 Add chard; cook 4 minutes, stirring constantly. 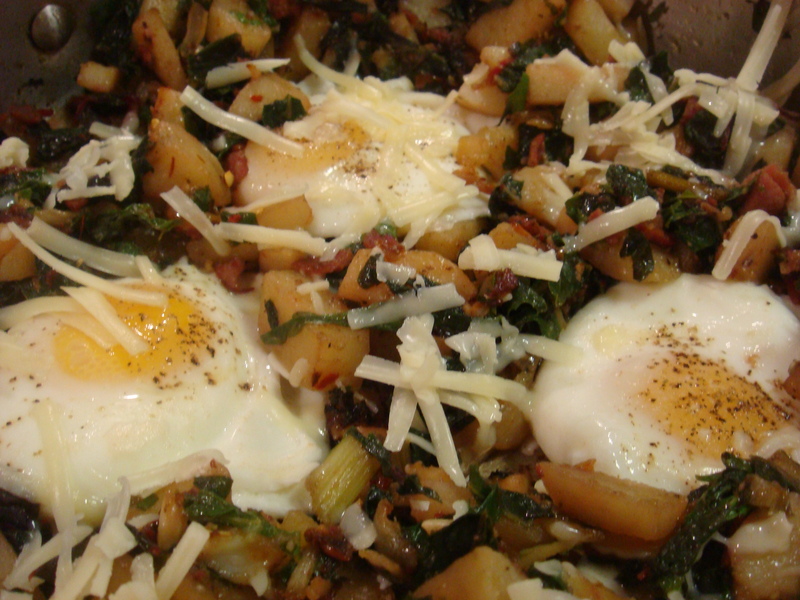 Using a spoon, push potato mixture aside to make 4 egg-size spaces. Crack 1 egg into each space; sprinkle remaining 1/4 teaspoon salt, remaining 1/4 teaspoon pepper, and remaining 1/4 teaspoon paprika over eggs. Cover and cook 3 minutes; sprinkle cheese over potato mixture. 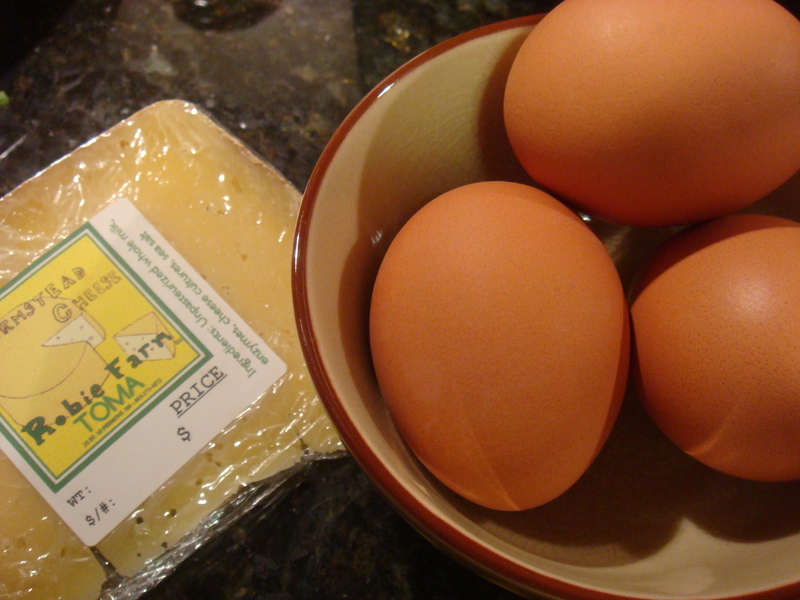 Cover and cook 2 minutes or until egg yolks are lightly set. Serve with fresh fruit for breakfast, lunch or a light evening meal. Since the folks in my house like their eggs well done, I poached them for seven minutes in a separate pan and then added them to the hash mixture to finish cooking. You are currently reading Farm Fresh Hash at The Prude Papers.